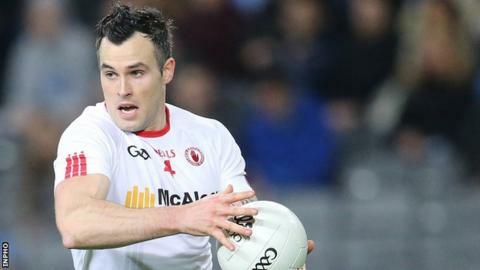 The return of defender Cathal McCarron is the only Tyrone change for Saturday's All-Ireland SFC quarter-final against Ulster rivals Monaghan. The experienced McCarron missed the qualifier win over Sligo last weekend because of his brother's wedding. Monaghan stick with the 15 which started in their Ulster Championship final victory over Donegal on 19 July. It's the third year in a row Tyrone and Monaghan have met in the championship, the sides winning one match each. Tyrone won an All-Ireland quarter-final between the teams in 2013, by 0-14 to 0-12. Last year, Monaghan claimed their first championship victory over Tyrone since 1988 with a 1-12 to 0-14 victory over Mickey Harte's team in Clones, Dermot Malone with the only goal of the game at the start of the second half. McCarron is likely to be handed the task of trying to contain Farney ace Conor McManus at Croke Park. The Dromore defender curbed McManus' influence when the sides met in the quarter-finals two years ago, restricting him to two points from play. Rory Brennan drops to the bench but two other members of the All-Ireland winning Under-21 team - Mark Bradley and Conor Meyler - will start in the half-forward line. Niall Morgan holds on to his place in goal, despite the return to fitness of Mickey O'Neill, following minor surgery on a knee injury. Tyrone: N Morgan; A McCrory, R McNamee, C McCarron; R McNabb, Joe McMahon, P Harte; C Cavanagh, M Donnelly; T McCann, M Bradley, C Meyler; D McCurry, S Cavanagh, C McAliskey. Monaghan: R Beggan; C Walshe, V Corey, R Wylie; D Mone, N McAdam, K O'Connell; O Lennon, F `Kelly; K Duffy, D Hughes, O Duffy; D Malone, K Hughes, C McManus.